* for countries that are not under CE regulations or for studies that are compliant to the regulations as mentioned above, we will provide you Rugloop with full TCI capability. More information. * for all other cases and for all-day clinical practice by medical professionals, we have decided to derive the RugloopII tracker version. This program will track your manual actions on the connected infusion pumps and calculate the resulting TCI concentrations from it. More information. * Rugloop has been tested extensively in earlier studies. * ease of use & little additional learning: if you can operate Microsoft Word, you can operate Rugloop. Self-installer, extensive user-manual and help functionality are provided. * the TCI/tracker versions will, on request, provide the functionality of Rugloop monitor-only as well. For more information, and for information on Rugloop in general, see here. * we envision a target price for Rugloop TCI or Rugloop Tracker of +/-499,- Euro for an initial subscription, and 99,- Euro per year support fee. All software is node-locked. * Rugloop software is plug-and-play, and comes with an extensive user manual. If you have a PC running Windows 98, Windows NT, Windows 2K or XP, installation is straightforward. You will need 1 serial port per pump to control. If you are reluctant modifying your PC, please contact us for installation support. We can arrange hardware packages with serial ports, or even a full installation on your (or a new) PC. * Pump manufacturers: if you are interested to allow TCI/Tracking on your devices as well, please contact us. * we are still working on all this. If you would like to be kept up-to-date with news about Rugloop / Rugloop TCI / Rugloop Tracker, please fill in the form below to be added to the Rugloop mailing list. REMARKS: the Rugloop mailing list is only used by Demed to inform you about news related to Rugloop & the companion program Labgrab. * you can use a program that you've written yourselve, or in joint studies with the software developers. - AND you have to inform the authorities from the Country where the study is performed that you use RUGLOOP for a clinical study, following regulations of notification as described in the law of the different member states of the European Community. For countries that are not under CE regulations or for studies that are compliant to the regulations as mentioned in The European community, CE regulations & TCI, we will provide Rugloop with full TCI capability. We will send you a contract where you confirm that it is allowed to use Rugloop-like software in the circumstances you intend to. For Europe, we will also ask for the notification to your national authorities. (we can be held responsible for abuse of the program, so we have to take our precautions, unfortunately). Please contact us. For all other cases, also for all-day clinical practice by medical professionals, our logical decision was to derive the RugloopII tracker version. 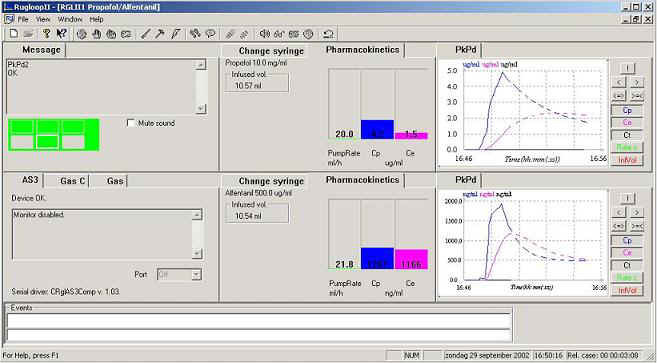 This program will track your manual actions on the connected infusion pumps, and calculate an estimated plasma concentration for the set drug & infusate concentration. In addition, it will provide a trajectory presentation of the expected concentration in time at the currently set infusion rate. We are currently still working on the tracker version; we expect to release an initial version connecting to the Alaris Asena infusion devices somewhere end of november. We would like to stress that Rugloop will NOT control the pump: YOU ARE. YOU take all decisions concerning infusion rate and administered volumes. Rugloop is only monitoring. The calculated concentrations are given to you for information. YOU decide. 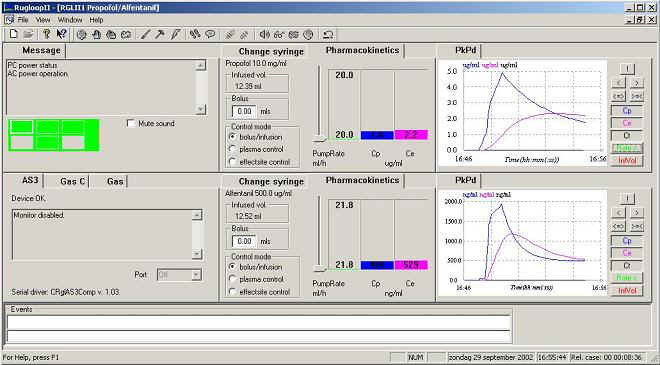 * you will be able to monitor multiple pumps with different drugs with RugloopII. Michel M. R. F. Struys, M.D., Ph.D.; Tom De Smet, M.Sc. ; Birgit Depoorter, M.D. ; Linda F. M. Versichelen, M.D. ; Eric P. Mortier, M.D., D.Sc. ; Frank J. E. Dumortier, M.D. ; Steven L. Shafer, M.D. ; Georges Rolly, M.D., Ph.D.